In the summer of 1986, I was twelve years old and in full-on comic book collecting mode. At the time, my mother taught arts & crafts classes at a store called Country Merchant. One afternoon, I convinced her to stop by the grocery store on the way to her class so I could pick up a new comic to read while she was teaching. 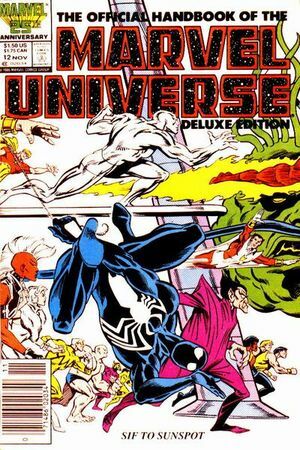 When I saw the cover to The Official Handbook to the Marvel Universe Deluxe Edition #12 that afternoon, I knew had to have it. Spider-Man and the Silver Surfer alone would have been enough to sell me on it, but I also recognized Storm from the X-Men and Namor, the Sub-Mariner. There were other characters on the cover though, that I didn’t recognize. While Mom taught her class, I pored over that comic, only pausing long enough to buy some Strawberry/Grape Nerds and a cold soda from the bowling alley a few doors down from the store. This was my sugar-fueled introduction to the strange new characters on that cover: the Squadron Supreme. The Squadron Supreme first appeared in the 70s, but are most famous for their 12 issue mini-series, published in 1985 and 1986. For a long time, my only exposure to the Squadron came from the summary in the OHotMU (love that acronym), but at some point in the years since then, I read the trade paperback collecting the series. Recently, I reread it on once again using my Marvel Unlimited subscription. It’s a powerful tale, and doesn’t get nearly the coverage it deserves, so I thought I would share a few thoughts on it. My few thoughts quickly grew into a lengthy review, too long for one blog post. Today, I will simply cover a bit of comic book history in order to provide some context to the story, and take a look at the events in the first three issues of the mini-series. The mid-1980s was a time of great change in the comic book industry, which was transitioning from the Bronze Age to the Modern Age. The Bronze Age began in the early 70s, and was characterized by abandoning the outlandishness and moral purity of the Silver Age and taking on a more realistic tone. In the Bronze Age, comic characters actually died: Spider-Man couldn’t save Gwen Stacey, and Jean Grey allowed herself to be killed at the end of the Dark Phoenix saga. During this time, Batman shunned the 60s TV series, Adam West influence and became a more sophisticated, globe trotting hero, best exemplified by the famed Denny O’Niel/Neal Adams run. Green Lantern and Green Arrow teamed up to tackle social issues like racism and drug abuse. Following the Bronze Age, the Modern Age took the realism of the previous decade and a half and cranked it up. Frank Miller’s work on Batman (Year One and The Dark Knight Returns) remade the World’s Greatest Detective into a more brutal, Darker character. The Dark Knight Returns, in particular, shaped Batman’s portrayal in the years ever since into a grim, brooding character. Alan Moore and Dave Gibbons’ Watchmen used new characters loosely based on those DC Comics aquired when they bought out Charlton. With freedom from continuity and editorial constraints, the two creators made a masterpiece that redefined the concept of the super hero. In Crisis on Infinite Earths, the DC multiverse, including many beloved Golden and Silver Age characters, was destroyed. A single, more new-reader friendly universe was created, and populated with characters that looked similar, but acted slightly differently. One example of post-Crisis revision was the relationship between Batman and Superman; previously, they were the closest of friends, but now they often found themselves at odds with one another due to their vastly different viewpoints on the world. This was a far cry from the happy feely days of their monthly team-ups in World’s Finest Comics. Over at Marvel, the transition to the Modern Age was a bit less clearly defined. Two of the grimmer, grittier characters who flourished in the Modern Age were Wolverine and the Punisher. Though both were created in the Bronze Age, their more direct methods, willingness to kill, and darker nature would be emphasized and emulated throughout the Marvel Universe. Captain America resigned his post after a disagreement with the government and became known simply as the Captain, wearing a less-than-patriotic black, white, and red suit. Iron Man fought the Demon in a Bottle in the late 70s, but constant struggle with alcoholism became a long-running plot point in the 80s. Like Cap, Tony Stark gave up wearing the Iron Man armor for a time, and came into direct conflict with other heroes in the Armor Wars saga. Even the quintessential everyman hero, Spider-Man, received a black costume, which eventually became one of his greatest enemies, Venom. During the landmark Kraven’s Last Hunt series, Kraven the Hunter defeats Spider-Man and takes on his mantle in brutal fashion. Very early on in this time of great change in comics, writer Mark Gruenwald told the epic tale of the Squadron Supreme, which is undoubtedly his magnum opus. The mini-series ran concurrently with Watchmen, and predated The Dark Knight Returns and most of the other comics that heralded the beginning of the Modern Age. Though it is undoubtedly less famous and influential than these other works, Squadron Supreme shares many of the same characteristic elements with them. Innocence, clear-cut morals, and happy endings are thrown out the window, and what is left is a brutally honest, achingly realistic take on the havoc that a group of super-powered characters can wreak, even though they have the best of intentions. Upon first glance, the Squadron Supreme would seem to be a knock-off of the Justice League. The similarities are too obvious to ignore. Hyperion is a super-powerful paragon from another world with amazing strength and atomic vision. Nighthawk is a normal (albeit wealthy) fellow who fights crime in a blue and black suit. Power Princess is a tall, beautiful, dark-haired warrior princess from a storied place called Utopia Island. Even more obvious ripoffs are super-quick speedster the Whizzer and Doctor Spectrum, who makes constructs of light using a powerful gemstone. There are some minor differences in the main cast, and a few less obvious analogs (Tom Thumb is sort-of the Atom, but mostly not). 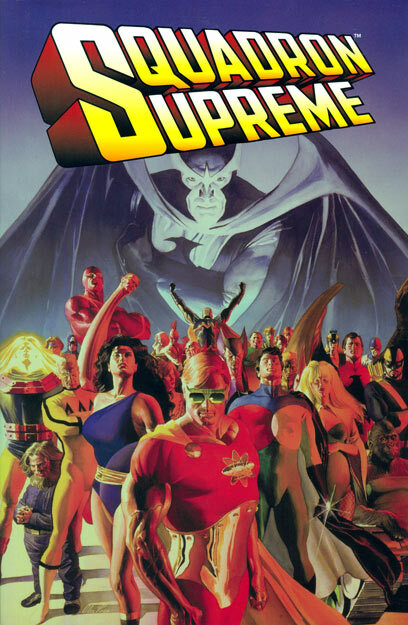 There are a good number of new characters, particularly within the large supporting cast, but in essence, the Squadron Supreme is a Marvel-ized version of DC Comics’ premiere superteam. Because of these similarities, it was wise of Gruenwald to use the Squadron Supreme for his story. He couldn’t use the more popular, existing Marvel characters, since the story wouldn’t really work in the standard Marvel Universe. Introducing totally new characters would have been very difficult, given how many of them are involved. Using characters so clearly based on previously established archetypes is a great solution. It worked for Alan Moore and the Watchmen, and it works here too. There are so many characters that few of them have any significant amount of “screen time”. The similarity they share with other heroes with known powers, personalities, and motivations allows the reader to quickly and easily relate to them. The first issue of the mini-series begins with the Squadron Supreme split up and working in teams. One group deals with the Squadron’s satellite home base, which is falling quickly out of orbit. Another set of teammates handles an interaction between a group of soldiers guarding food stores and a hungry mob. The remaining Squadron members risk their lives dealing with a fire at a natural gas plant. These sequences are an excellent introduction to the team, as the reader can quickly get a sense of the personalities and powers of each member. The Squadron meets back up, and we are given some background information. Recently, Nighthawk, who had been elected President in his civilian identity, was mind-controlled by the alien villain Overmind. Against his will, Nighthawk led Overmind to the rest of the Squadron, and only Hyperion managed to escape the alien’s influence. The rest of the Squadron was forced to take over the American government, then began war with the rest of the world. After the Squadron’s total victory, the whole Earth became one big police state under their rule. In the end, the Squadron managed to foil Overmind’s scheme, but there is an extreme amount of damage to repair and many problems to be solved. The Squadron is at its lowest point; they are hurting, ashamed and frustrated. Hyperion, unhappy with all the problems caused by the Squadron’s near-defeat, suggests that they take on a more active role in world events. The Squadron’s first in command believes they should work to eliminate war, crime, hunger, disease, and even death itself from the world. After some debate, a vote is cast, and only Nighthawk and Amphibian (the Squadron’s Aquaman analog) are opposed to Hyperion’s scheme. Nighthawk resigns the Squadron in protest. Realizing the implications of Hyperion’s plan, Nighthawk makes plans to assassinate his old friend with a Kryptonite Argonite bullet. Joining the Squadron at a press conference, Nighthawk resigns as President, and draws his weapon as Hyperion announces that the Squadron will take over the government. Nighthawk struggles with his conscience but in the end cannot bring himself to violate his principles by killing his friend. As the Squadron Supreme unmasks, they vow to solve all the world’s problems within one year. And all this happens in just the first issue! It’s clear even from this early point that this is not your ordinary comic book series. There are no simple bank robbers being caught, or muggers being apprehended; we’ve essentially got Batman contemplating murdering Superman as the climax of issue #1. The focus of the entire mini series is on the conflicts in the Squadron Supreme itself, and oh boy, are there conflicts. These characters are put into situations that are grueling and terrifying, but always realistic and authentic. The struggles they go through feel natural, which is something you don’t often say about comics, particularly the standard fare of the time. Often, the heroes in the Squadron act in totally selfish ways and the results of these actions are far-reaching. The real meat of the tale is how the Squadron members deal with the consequences of being super heroes who have made the decision to rule the world. In issues #2 and #3, young Squadron member Nuke, with nuclear-based powers, learns that he has unknowingly been emitting strong radiation, and this radiation is killing his parents. Nuke approaches Tom Thumb, the Squadron’s resident super-scientist, and asks him to find a cure for cancer. Tom works frantically to do so, but cannot. Desperate to fulfill his promise to a friend, Tom uses a time travel device to contact a villain from the future, the Scarlet Centurion, in order to obtain a cure. The Scarlet Centurion eagerly agrees to share the cure, but under one condition: Tom must use deadly argonite on Hyperion, weakening him so the Centurion can finally defeat his most hated opponent. Tom is torn by the offer; he weights the cost of one life, even that of a friend, against the lives that could be saved with a cancer cure. In the end, Tom refuses the Scarlet Centurion’s offer, and returns home where he shares the bad news with Nuke. Nuke is distraught over his friend’s failure, and blames Tom when his parents die. The young hero disappears for some time, and though Tom knows why Nuke left, he keeps it from the rest of the Squadron in shame. Eventually, Doctor Spectrum is sent to track down Nuke, and finds the young man near his parents’ graves, mad with grief. Nuke sees the opportunity to take out his anger on his teammate, and attacks him. During the fight, while defending himself from his fellow Squadron member’s vengeful attack, Spectrum encloses Nuke in a power bubble. Nuke attempts to escape, but dies when he burns up all the air in the bubble. Though it was an accident, Doctor Spectrum bears a heavy burden of shame regarding his role in Nuke’s death for the remainder of the series. There are obvious similarities between Nuke and Doctor Manhattan from Watchmen; I don’t recall seeing plot points like this before, but it seems quite plausible in hindsight. This entire sequence of events with Nuke, Tom Thumb, and Doctor Spectrum is dark and depressing, but, it feels genuine and natural. Again and again, this theme repeats throughout the series. Comic fans have often wondered what it would be like in the real world if people had honest-to-goodness super powers. The naive Silver Age comics aren’t a good representation of this, and while Bronze Age comics are more realistic, we still had morally upright heroes with few (if any) flaws. Squadron Supreme does a fantastic job of presenting characters (I hesitate to call them heroes) with authentic problems and negative characteristics. It’s an engaging read, and the first three issues I’ve talked about at length in the post only scratch the surface of the whole story. 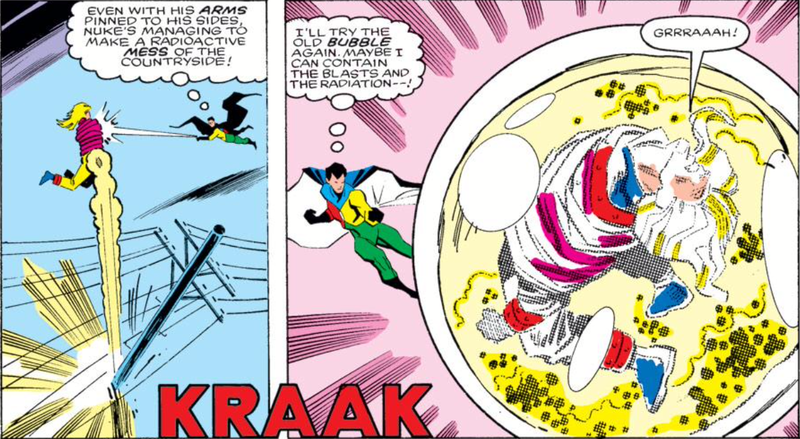 In my next post, we’ll take a look at one of the most prominent themes of the series as the Squadron Supreme develops a behavior modification device. The nature of free will and other very muddy moral situations come to light, as you might expect. It’s powerful stuff! Previous HEY YOU GUYS! We Did a Goonies Podcast!